Last week, Harmonix's corporate domain registrar privately registered a handful of domains including harmonixchroma.com, harmonixchromagame.com, chroma-game.com, chromaalpha.com and chromabeta.com. These domains follow an August 2012 trademark application for "Chroma." While most of those domains are fairly standard for any game from a major company, one of them—"chromaalpha"—is particularly unusual, and I wonder if might be a hint Harmonix is hopping on the Early Access bandwagon. From Minecraft to DayZ, alpha releases have steadily gained traction in the past several years, affording developers an opportunity to use a community's feedback to readily modify and evolve a game still in the throes of development. Given the philosophical contrast between potentially unstable early versions and closed console platforms, the alpha release scene is unsurprisingly PC-centric, which could perhaps be a bit of a deviation for Harmonix, a company that has never released a game for PC. Harmonix, which is also currently working on Fantasia: Music Evolved for Kinect, arguably had a bit of a tumultuous 2013. The company had two rounds of layoffs in April and December, citing "shifting staffing priorities" for future projects in both instances. 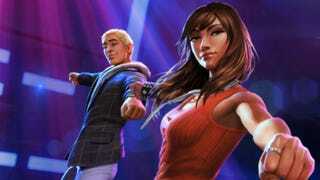 To accommodate the needs of those future projects, the company ended DLC updates for both Dance Central and Rock Band. Additionally, an "unannounced Xbox One Kinect title" Harmonix was working on was cancelled, according to a designer's CV. The identity of the Harmonix cancelled next-gen Kinect game is unknown, and it may very well be the another next Dance Central (that's art for the series pictured up top, by the way), but I would personally guess it was the next-gen new IP featuring combat. As some may recall, Harmonix, a developer not known for games with combat, was hiring for a combat designer in summer 2012. The job listing said the combat designer was "to create real-time, single-player combat experiences" on "a project that is unlike anything Harmonix has ever done before." That job listing came several months after a Harmonix senior level designer opening for an "innovative new motion-gaming IP" that featured "combat encounters." Of all of Harmonix's projects, this sounded like the riskiest, as Harmonix's ability to make an action game is not yet proven. Musical combat? Combat musical? Rock Band: Combat? Combat: The Beatles? In a March 2013 blog post about joining Harmonix's board of directors, venture capitalist Brad Feld mentioned that the studio was working on three new major projects at the time, each of which dealt with a different manner of human-computer interaction. Feld also told Fortune Harmonix was developing some "really interesting [mobile] projects" in addition to more traditional releases. Earlier this month, Sean Stewart—writer behind early Microsoft-related ARGs "The Beast" and "I Love Bees"—quietly confirmed on Twitter he had joined Microsoft's new Xbox Entertainment Studios in Los Angeles as a creative director. Stewart's LinkedIn page says he has served in the role in September, and his job is to help "create new, compelling experiences that use the power of the Xbox digital ecosystem to enhance great original television." Stewart is the second creative principle from "The Beast" and "I Love Bees" to join Microsoft's burgeoning entertainment effort. Last June, Microsoft announced it had appointed Elan Lee—who served as lead designer on "The Beast" and "I Love Bees" and cofounded the now-defunct multiplatform entertainment firm Fourth Wall Studios with Stewart — as chief design officer at Xbox Entertainment Studios. Jim Stewartson, the third cofounder and former CEO of Fourth Wall Studios, writes on resume that he "Advised Microsoft/XBOX Studios on next-generation TV" during his time at Fourth Wall. Stewart joining Microsoft would perhaps also explain Major Nelson's recent playfully coy tweet about his fascination with bees. On his resume, a former PopCap executive says he "Started up a new project within PopCap to explore opportunities in the toy-meets-game space" in the first half of 2013. It's unclear whether this project is still ongoing, but the colorful characters of Peggle or Plants vs. Zombies seem like pretty decent choices for potential toy-game convergence. Maybe this will bring us closer to a Skylanders-esque platformer exploring the Peggleverse in full. Finally, a former executive at independent gaming conglomerate Foundation 9—who owns the likes of Double Helix and Sumo Digital—reveals on his resume that a newly established mobile division of the company called Rogue Play is working on a "AAA mobile" tie-in for the forthcoming reboot of Godzilla. Rogue Play's site says they specialize in "midcore freemium games," so presumably that is the form this mobile Godzilla game will take.